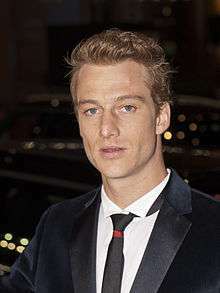 Alexander Fehling (born 29 March 1981) is a German film and stage actor. He is best known as Staff Sgt. Wilhelm in the 2009 Quentin Tarantino WWII film, Inglourious Basterds and Jonas Hollander in the Showtime original series Homeland as the boyfriend of Claire Danes's character Carrie Mathison. Fehling was born in East Berlin, East Germany. He studied acting at the Ernst Busch Academy of Dramatic Arts from 2003 until 2007. Fehling received the Förderpreis Deutscher Film award in the category of drama for his portrayal of Sven Lehnert in the 2006 film, And Along Come Tourists. He had previously won the OE Hasse Prize from the Akademie der Künste, Berlin for his role as Prince in the theater production of Schneewittchen (Snow White). Fehling is best known to English-speaking audiences for his role as German Master Sgt. Wilhelm in Quentin Tarantino's World War II 2009 film Inglourious Basterds. Fehling is incorrectly referred to as a Staff Sgt by the English captions. Fehling also dubs his performance in the German version of the film. In October 2015, Fehling began appearing as a series regular in the fifth season of the Showtime original series Homeland. He plays Jonas Hollander, a legal counsel for the Düring Foundation and the boyfriend of Claire Danes's character Carrie Mathison. 2007: The Förderpreis Deutscher Film ("German Film Prize") in the best dramatic actor category for his role as Sven Lehnert in the 2006 film, And Along Come Tourists. ↑ Shattuck, Kathryn (30 September 2015). "Alexander Fehling: A Wild Ride From Inglourious Basterds to Homeland". The New York Times. Retrieved 23 October 2016. ↑ Agard, Chancellor (18 October 2015). "Meet Homeland's Alexander Fehling, Who Plays Carrie's Hot New Man". People. Retrieved 23 October 2016. Wikimedia Commons has media related to Alexander Fehling.